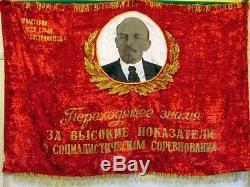 Rare Genuine large Soviet Russian thick velvet banner/flag with fringe. 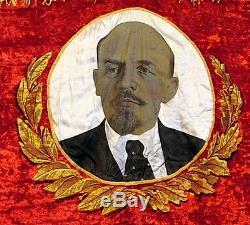 Front: detailed image of Vladimir Lenin on cotton. 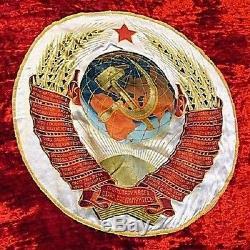 Russian text "For high performance in the socialist competition" Reverse: State Emblem of the Soviet Union, high quality detailed image on cotton with USSR motto Proletarians Of All Countries Unite in all 15 languages of the Soviet Union republics. Text below: To realize the plans of the Party into live. Very big exquisite quality flag, size 175 x 120 cm. 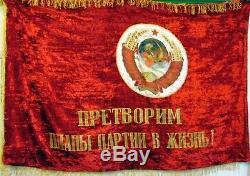 The item "Rare Vintage Large Soviet Russian Original Velvet USSR Flag/Banner with Fringe" is in sale since Thursday, March 27, 2014. This item is in the category "Collectables\Memorabilia\Russian & Soviet Union". The seller is "fort-45" and is located in London. This item can be shipped worldwide.